The National Institution for Transforming India (NITI Aayog), the think-tank of the Indian government, and ABB India have signed a Statement of Intent (SoI) to support the Indian government realize its ambitious vision of ‘Make in India’ through advanced manufacturing technologies that incorporate the latest developments in robotics and artificial intelligence. NITI Aayog will work with ABB to prepare key sectors of the economy, such as the power and water utilities sector, industries like the heavy industries sector, and the transport (rail and metro) and infrastructure sectors for digitalization, the Internet of Things (IoT) and Artificial Intelligence (AI). The initiative also covers the fast growing segment of electric mobility. Jointly, NITI Aayog and ABB will work with government ministries, solicit feedback for areas critical to them, and discuss solutions using industrial automation, and digitalization technologies. “This collaboration, which will include cross-sectoral understanding of digitalization at ABB’s world class centres, will be key in driving progress of key sectors in India. This collaboration is meant to lead to actionable insights and focussed plans that will help India become a centre for advanced manufacturing,” said Amitabh Kant, CEO of NITI Aayog. The first workshop for senior government officials, under this collaboration, would be organised in June, 2018, at the ABB Ability Innovation Centre in Bengaluru, which is the company’s biggest research and development centre in the world. The first workshop will focus on the Indian food processing sector. Similar workshops will be organized for other sectors such as power, urban development and transport in the near future. NITI Aayog and all stakeholders will experience hands-on experience of ABB Ability, the company’s comprehensive digital portfolio of solutions that deliver value of industrial digitalization to utilities, industries and transportation and infrastructure. In addition, workshops will be held at ABB Power Technology Experience Centre (ABB PowerTEC), Vadodara, India’s leading technology and knowledge training institute, which will focus on power engineering, grid automation and digitalization. Both facilities integrate best-in-class technologies and in-depth technical knowledge. 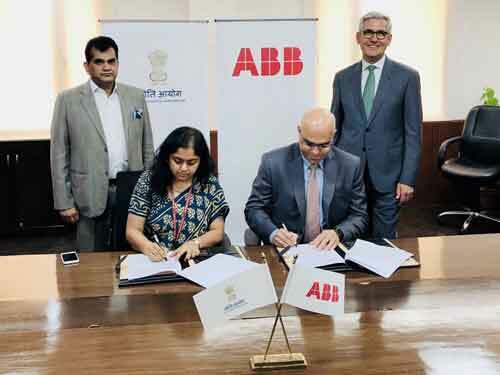 Anna Roy of NITI Aayog and Sanjeev Sharma, Managing Director of ABB India, sign a statement of partnership in advanced manufacturing technologies, including digital and AI, in New Delhi. Looking on are Amitabh Kant, CEO of NITI Aayog, and Ulrich Spiesshofer, CEO of ABB.